By a variety of measures, U.S. military policies in the Afghanistan war are failing. You probably haven’t heard much about this, in part because of the justified media focus on Haiti, but a confluence of very bad indicators point to failure even by the military’s avowed yardsticks. The civilian casualty rate in Afghanistan rose significantly in 2009. War-related violence is at its peak since 2001. The armed resistance to the Kabul government is spreading rapidly and can now "sustain itself indefinitely" according to the top military intelligence officer in the region. Efforts to build the Afghan National Army are flailing, as are pro-government efforts to rebuild infrastructure. In short, despite the happy talk from General Stanley McChrystal and Admiral James Stavridis, a great many signs indicate that the U.S.-led pro-government coalition is headed for failure. Although I expect stiff fighting ahead, the measure of effectiveness will not be enemy killed. It will be the number of Afghans shielded from violence. Civilian deaths in Afghanistan climbed in 2009 to their highest number since the fall of the Taliban, the United Nations says in a recent report. Several bloggers have touted the fact that the U.S.-led, pro-government forces killed about 28 percent fewer civilians than last year: 596 in 2009 compared to 828 in 2008. This sort of self-congratulation is as myopic as it is callous. The pro-Kabul-government coalition killed roughly 600 people whose right to life exists independent of the U.S.’s desire to eliminate Al-Qaida and the Taliban. Only the most idiotic messengers would cheer about this statistic in public. Imagine a man cheering that he only beat his wife six times this month compared to eight times last month. 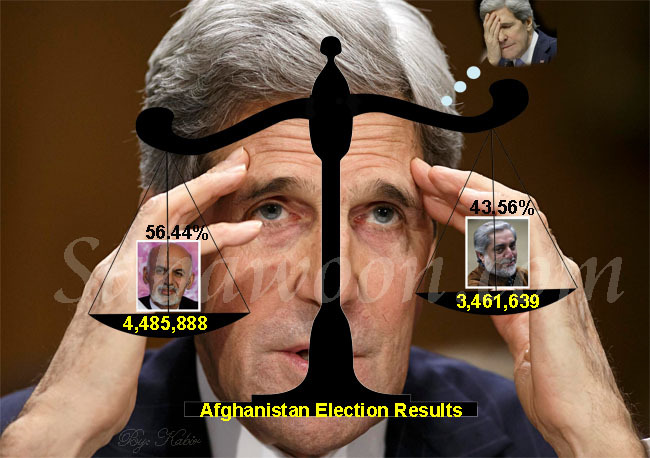 That’s what chief ISAF spokesman Col. Wayne Shanks means when he says, "Statistical kinds of things don’t play that well [in Afghanistan].” Journalists, bloggers and public officials who tout this statistic like it’s some sort of victory should have their pulses checked and their canines examined. The same goes for comparisons between the number of combatants killed by the pro-government forces and the number killed by the armed opposition. U.S. policymakers rationalized the addition of more U.S. troops in Afghanistan by claiming the new forces would be able to protect the civilian population. Noting the ratio of casualties attributed to either side of the conflict is a weak salve if the addition of new forces did not lead to an overall drop in the civilian death rate. If coalition leaders can only point to the ratio of civilians killed by either side, they are tacitly admitting that they new troops cannot protect the population from the insurgents. That admission would fit with the facts in the UN’s report. [N]o matter who’s actually causing the violence, the people hold the coalition forces and central government responsible — as veteran combat reporter David Wood wrote on Friday for Politics Daily. Cheering that we’re killing fewer innocent bystanders than anti-government elements is a losing argument. Referring back to the gang violence analogy: If police officers declare they are moving into a neighborhood to deal with a gang problem, touting the fact that today they’re killing fewer innocent bystanders a) is just another way of saying "We’re killing some bystanders," and b) tells you absolutely nothing about their success or failure in dealing with the gang problem. But, it turns out that the U.S. military has some very good statistics on the state of the "gang problem" in Afghanistan. It’s spiraling out of control. Major General Michael T. Flynn ruffled some feathers earlier this month when he released a scathing critique of U.S. intelligence operations in Afghanistan through a Washington, D.C.-based think tank. Less attention was given to a far more consequential presentation authored by Flynn in late December 2009: The State of the Insurgency [h/t Wired's Danger Room blog]. The graphics in the slide show are time lapse images of creeping yellow and red smears, ever-escalating bar-chart waves of mayhem. It shows an insurgency on the wax and a dynamic of violence that grows as we add troops. "The Afghan insurgency can sustain itself indefinitely"
"The Taliban retains required partnerships to sustain support, fuel legitimacy and bolster capacity"
"Organizational capabilities and operational reach [of the insurgency] are qualitatively and geographically expanding"
"Taliban influence expanding; contesting and controlling additional areas." "The Taliban now has “Shadow Governors” in 33 of 34 provinces (as of DEC 09)" …up from 11 in 2005. "Regional instability is rapidly increasing and getting worse"
"Kinetic events are up 300% since 2007 and an additional 60% since 2008." Also notable is what Flynn’s presentation does not describe: there are no mentions of a swing in momentum brought on by the significant increase in U.S. troops over the last year. It certainly does not describe the beginnings of a dynamic hoped for by the COIN pushers; absent is any mention of a population throwing its lot in with the Kabul-centered government. To the contrary, Flynn notes that detained insurgents were motivated by a "Karzai government universally seen as corrupt and ineffective" and pervasive crime and corruption amongst security forces. In an interview made public on January 11, 2010, ABC’s Diane Sawyer asked McChrystal, "Last we heard you said we needed a ‘quantum shift.’ We needed something dramatic, something to shift the momentum. Have you done it? Have you turned the tide?" McChrystal answered, "I believe we’re doing that now…I believe we are on our way to convincing the Afghan people that we are here to protect them." Sawyer plays the skeptic for about one second in this interview when she responds, "Already?" McChrystal answers, "We’ve been at this for about 7 months now." The general is either deceiving himself or Sawyer. There has been no quantum shift, according to Flynn’s presentation. The cyclical, seasonal spikes in violence are steadily worsening and the Taliban retains the momentum. And, various other indicators aside, McChrystal himself pointed to a singular measure for our success in Afghanistan during his confirmation hearings: "the number of Afghans shielded from violence." The United Nations’ latest report shows that the U.S.-led coalition is failing by the very measure proposed by its commanding general. McChrystal’s statement that "we’ve been at this for about 7 months now" is a two-fold assertion. On one hand, he’s asserting that we’re moving towards success in Afghanistan, an assertion flatly refuted by the information in Flynn’s report. On the other, he’s asserting that his "new" policies have been in place long enough to lead to have measurable effects on the ground in Afghanistan. With the first assertion being such a transparent untruth, McChrystal’s (and the wider Obama Administration’s) policies are damned by the second. If having been "at this for about 7 months now" has produced causal links rather than simple correlation between U.S. actions and the various indicators on the ground, the U.S. strategy in Afghanistan is leading to failure, along with massive human suffering purchased at enormous cost. As I complete this, there are reports of a major Taliban attack in Kabul. But by all means, gentlemen, continue the happy talk about the Afghanistan war. Originally posted at Rethink Afghanistan.